Climate and energy topics are a natural fit for NGSS. These subjects weave together science concepts with analyzing evidence, examining relationships between different parts of the Earth system, designing and evaluating solutions, and communicating findings. Retooling our teaching with the Next Generation Science Standards is exciting, but also daunting. We've provided several tools to ease the transition and help you find useful materials and assemble them into complete lesson plans. Every item in the collection is tagged with the standards it meets. From there, we have three ways to find what you need. 1. Use the NGSS browse to find areas with the most overlap in NGSS. 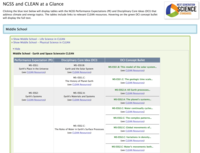 This is a subset of the CLEAN collection with the most relevance to NGSS, brought to you by a quick and intuitive search tool. 2. For a more detailed search, use the full search interface. Use the filters to sort by any NGSS standard, grade level, topic, and/or keyword. 3. Grab an overview to search by a specific standard. Skim the Performance Expectations and Disciplinary Core Ideas that are in the CLEAN collection. These expandable tables show you where CLEAN resources match up with PEs and DCIs, and link to the relevant materials. An overview, videos, planning template, and planning flowchart are all geared toward getting your creative ideas organized into a concrete lesson. Also includes three, ready-to-use examples. Earth Systems Investigations are four-step investigations that present a real-world problem designed to elicit student interest. Each step in the investigation includes one or more of the eight science and engineering practices. Educators can build a learning path with resources from the CLEAN Collection and other trusted sources. Design your own or use two ready-made examples. This webinar demonstrates how the CLEAN collection of educational resources are aligned to the Next Generation Science Standards (NGSS) and how CLEAN supports 3-dimensional learning. 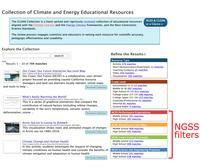 Learn how to search the CLEAN collection by NGSS climate and energy topics and at-a-glance standards tables. Presenter: Cheryl Manning, Earth Science Educator & NESTA President. 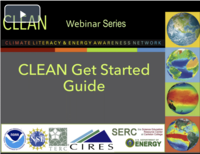 This webinar introduces the CLEAN Get Started Guide and its downloadable lesson planning resources to help you create their own climate and energy units and highlights three ready-to-use unit exemplars. This step-by-step guide incorporates the CLEAN collection of climate and energy resources and the NGSS three-dimensional instructional model. Presenter: Jennifer Taylor, Curriculum Development & Project Coordinator CIRES Education Outreach.